In the previous article, I had covered the Root Bridges of Meghalaya – https://randomvoyager.com/rootbridges/. 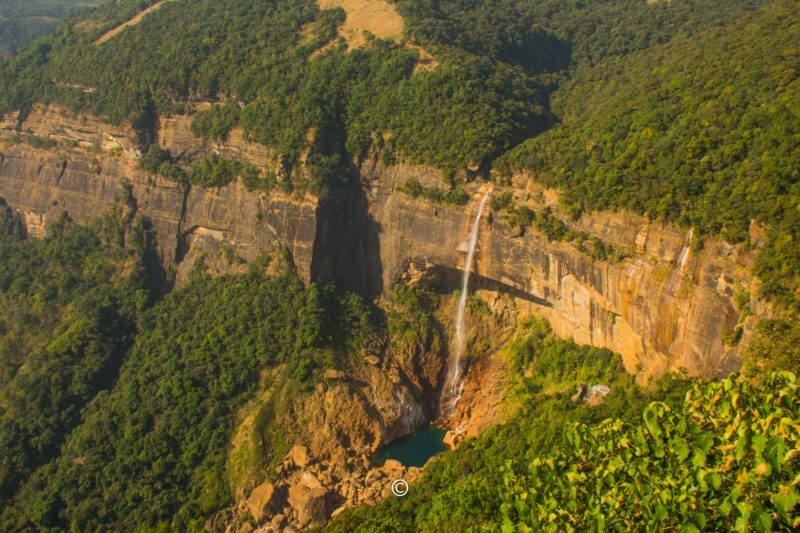 Continuing with this series, I will be covering the Waterfalls of Meghalaya though truth be told, Meghalaya is endowed with plenty of beautiful waterfalls in the nooks and crannies. 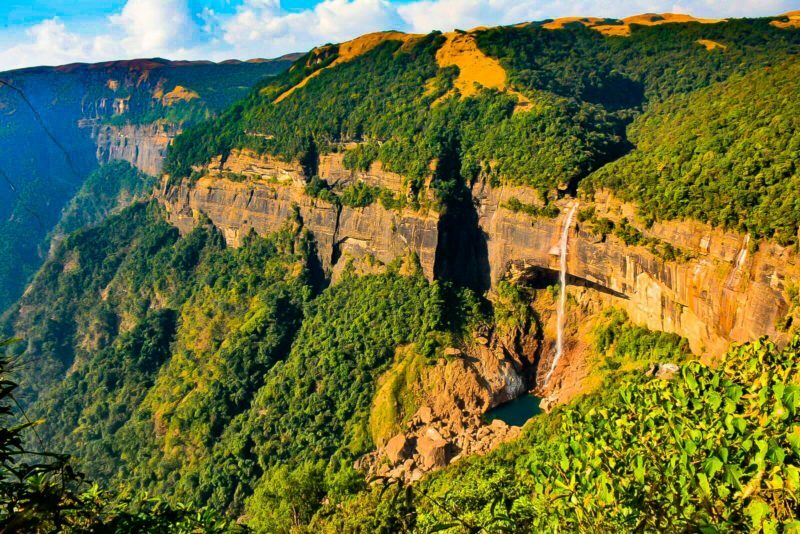 Also it has some of the tallest waterfalls in India. I am going to restrict myself to few popular (and some unknown) Waterfalls. Meghalaya does have an airport in Shillong but the popular commercial airlines have very few flights to Shillong. So it is convenient to fly into Guwahati and take a cab or a bus to cities in Meghalaya. We reached Guwahati late in the afternoon and we had to hurry to get to Shillong, the capital city of Meghalaya. As we drove down we could see the scenery changing slowly as we move towards Meghalaya. We started noticing the mountains and lovely tall trees all around us. The road started as a 3-way lanes from Guwahati to become 2-way lanes and finally to a single lane on each side. We stopped at Umiam lake which is right at the border of Meghalaya and Assam for some barbecued corn and photography. The Umiam lake, a manmade one, is a beautiful lake surrounded by beautiful mountains all around it. The waters were still and people all around us were awed at the beautiful sunset. We sat there for some 15 minutes and then drove on as sun sets faster in the East due to time difference not being taken into account. 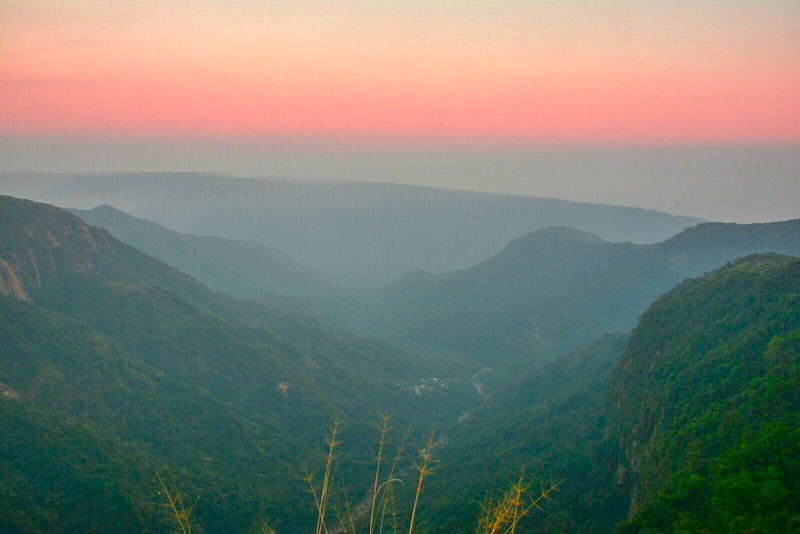 We wanted to reach Cherrapunji early so that we could have a walk around the city. We reached Cherrapunji after sunset, so we took a short walk around our hotel and settled in as the January cold was a bit biting at night time. We had the food in the restaurant and went to sleep. 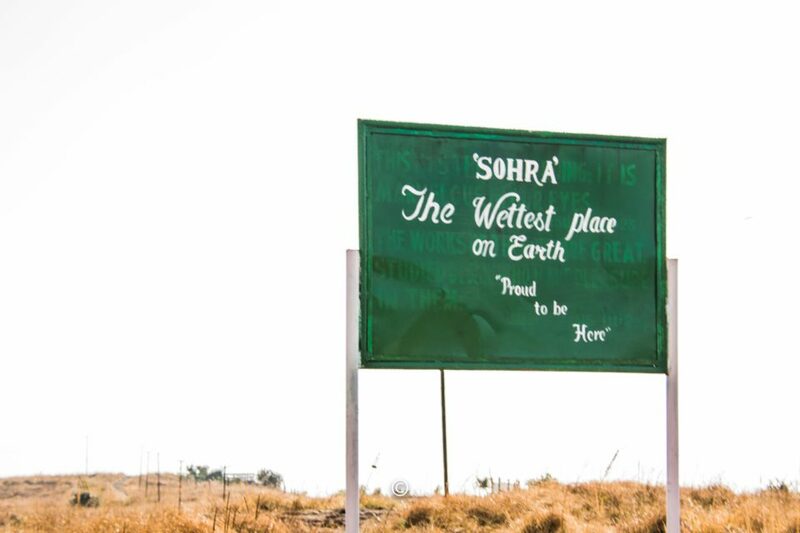 Sohra which has Cherrapunji is the wetest place in the earth. The next day we rented a taxi for local tour. We first went to Arwah Lumshynna Cave. One need to go on a short walk to get to the cave. 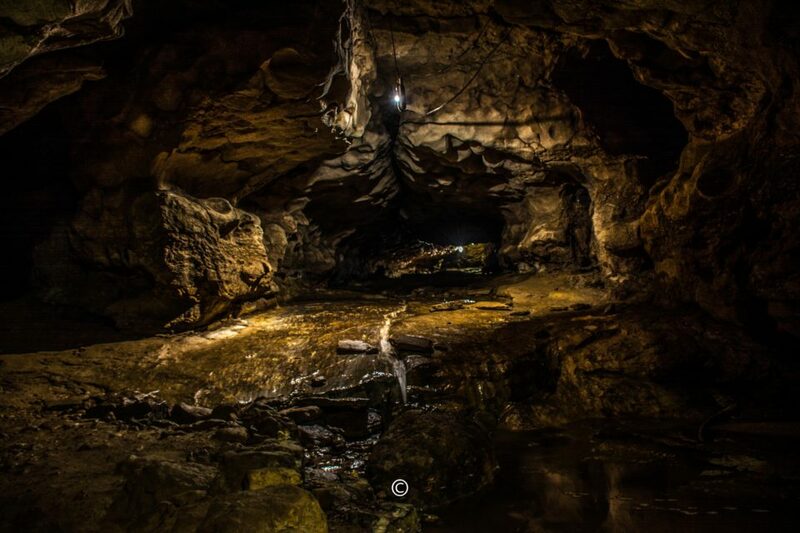 Inside the cave was lit and easy to walk. We came out and enjoyed the snake like falls that was trailing down the mountain on the side. 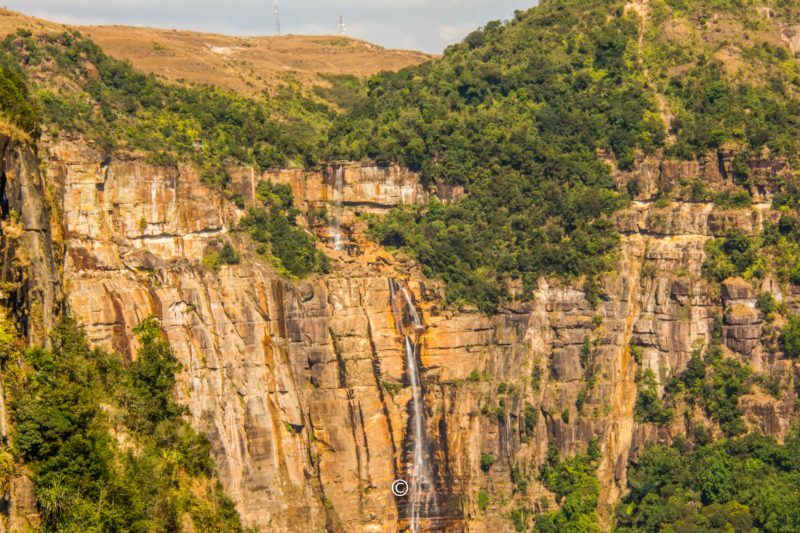 During the famed rainy days of Cherrapunji the entire side of the mountain becomes a gushing, roaring waterfall unlike the soft, serpentine one which we were looking at. We then proceeded to go to Dain Thlen Falls. This is a hidden gem that many people never go to, but I would suggest to have a small family picnic here. 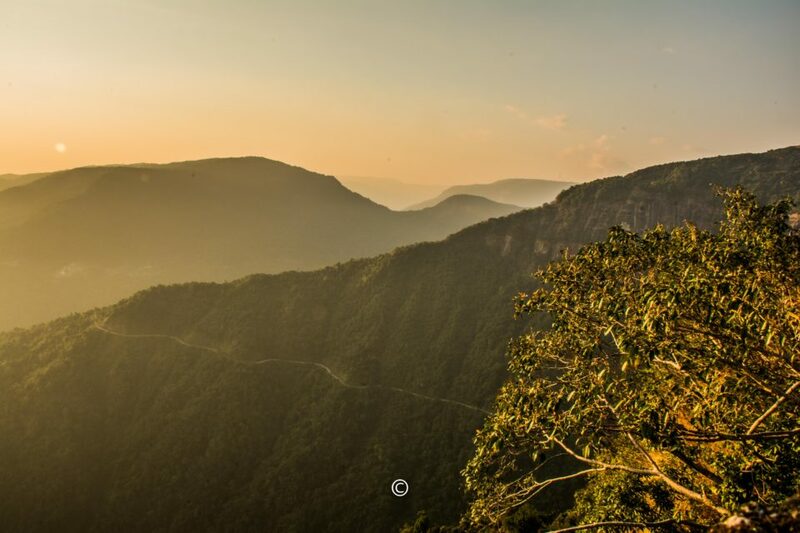 This is the only fall around Cherrapunji that is viewed from above and not the other way around. Once we came out of the parking lot, we walked on top of the smooth rocks to go to the other side of the falls to watch it falling down from top of the mountain down. We could not see the bottom of this fall, though we hiked a bit around to see where it all ended, but no such luck. The vegetation around it covered it well and gave an aura of secrecy to it. There was very large snake named Thlen that used to live in a cave nearby. This snake had the habit of eating half the number of people who used to pass by his cave. The Khasi people started dreading the snake and wanted to kill it somehow. In the meanwhile a goat herd boy called U Sudinoh befriended Thlen by offering him a goat as sacrifice everytime he went up to the cave. Thlen now started expecting the goat herd to give a goat daily. Whenever the goat herder called Thlen, he would come out with his mouth wide open to receive his sacrificial goat. One day the goat herd came with a iron ball heated up so red that it mimicked the goat meat and called out to Thlen. Thlen as usual came out with his mouth wide open, Sudinoh shoved the hot flaming iron ball into the mouth of snake killing it. It is said that when the snake writhed in pain the earth shook so hard that it seemed like an earthquake was occuring. Once the snake died the whole village cut up the snake , cooked it and ate it. They believed that eating every bit of the snake was the only way to completely annihilate it. Since then the place where Thlen was cut is called Dainthlen. One old lady from Sohra took a piece of this meat to serve to her son and forgot all about it. The soul from this piece of meat is said to have transmigrated itself as the Thlen. Thlen demanded Khasi human blood as sacrifice from the old lady. The Thlen also insisted that its victim should always be a Khasi and can not be killed with an iron rod as it was killed by an iron rod. This old lady became the first Thlen keeper unknowingly. She would hire a ‘Nongshohnoh’ to kill the victim with a wooden club and not an iron rod. The Nongshohnoh would stalk khasi people who went into the jungle alone. He would them club the person to death and then using a silver scissors would cut all the identifying parts of the body like eyes, eyebrows, earlobes, lips, toe nails, finger nails. He then uses a bamboo lancet to pierce the nose of the dying/dead man and a bamboo tube is used to collect the blood. The Thlen keeper in the meanwhile gets the house ready by spreading some kind of clothing on the floor , placing a brass plate on the floor and the blood is poured into this brass plate. She then beats the drum to call the Thlen from its resting place. The Thlen slides down and drinks up this blood as he does this the Thlen keeper asks the Thlen to bless them with wealth and prosperity. The Thlen keepers are greatly feared among the Khasi people. If anyone in the family wants to be rid of the curse of the Thlen , they can do so by leaving the property/home stark naked and not taking even a straw of bamboo with them. Symbolically saying that the person does not want to do anything with that home, neither the good nor the bad. This will free the person from the curse of the Thlen. We then drove to Nohkalikai Falls. It is the tallest plunge waterfall in India with a height from top to bottom of 1115 Ft.
Nohkalikai Falls from a distance. It is the tallest plunge waterfall in India with a height from top to bottom of 1115 Ft. According to popular legend, it is believed that a woman named Likai was widowed and left with a little girl to take care of. She had no means of income so she became a porter to take care of her daughter, she also remarried but continued her work as porter. Her job kept her busy , so she spent her entire free time with her little daughter, this led to a very jealous husband. One day when Ka Likai was out the husband killed her daughter and cooked her meat for lunch and threw the child’s head away. Ka Likai came to an empty home, saw the cooked meal, she ate her meal. After her meal she sat down to eat her betel leaf-nut as usual. She discovered her daughter’s severed finger in the betel leaf basket. She realised what had happened to her little girl, she ran out mad in grief and threw herself from the precipice near the falls, the falls since then has been called Nohkalikai Falls. This is a beautiful fall that falls into a small pool of greenest water I have ever seen. The drop is dramatic and one can hike about halfway down, after which there is no proper route to go down. Even during the driest of months there is enough water that falls down making for stunning landscape. The tall mountains and the dramatic drop of the unending waterfall into a green pool reminds one about the beauty of nature is always perfect. The sparkling rainbow just added to the overall beauty. We turned around and walked around the park a little bit as we wanted to enjoy the grandeur of this beautiful place a little more. The cold wind ruffling our hair and kissing our cheeks was just the kind of healing touch our souls needed. I wished for this afternoon to never end. It was one of the most serene experiences of my life. We drove off to Thangkharang Park. The park is situated at the edge of a cliff. We walked around a bit and reached the spot from which we could see some stunning views of the plains of Bangladesh in front of us. 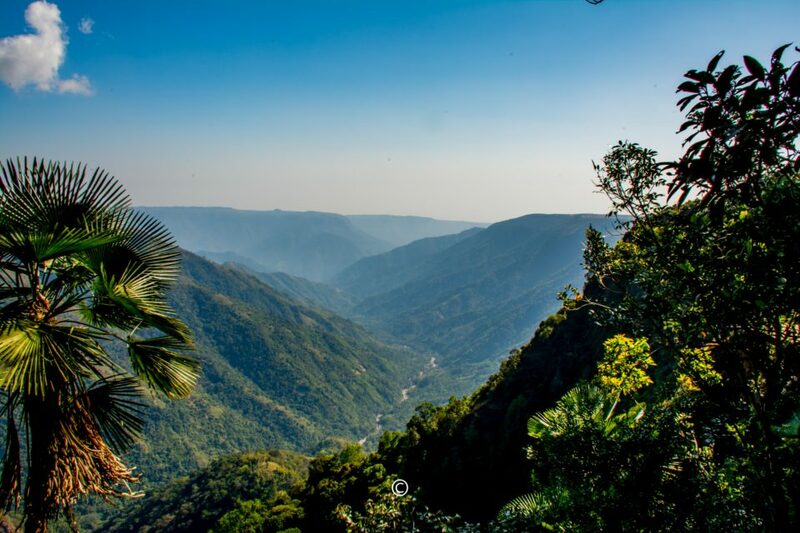 One can also view the huge Kynrem Falls (7th tallest waterfall in India) and the Khoh Ramhah rock from here on a clear day. We then visited the Khoh Ramhah rock a short distance away. This rock looks like an upturned Khasi basket. The rock itself is very plain and might not interest people but the stunning vistas around this place is quite a treat to the eye. Waiting for sunset and watching the sun slowly slipping behind the giant mountains was well worth our time at Khoh Ramhah. If you want a stunning view of the Khoh Ramhah Rock formation I would suggest one to drive on the Sohra Shella Road and keep a lookout for the view. 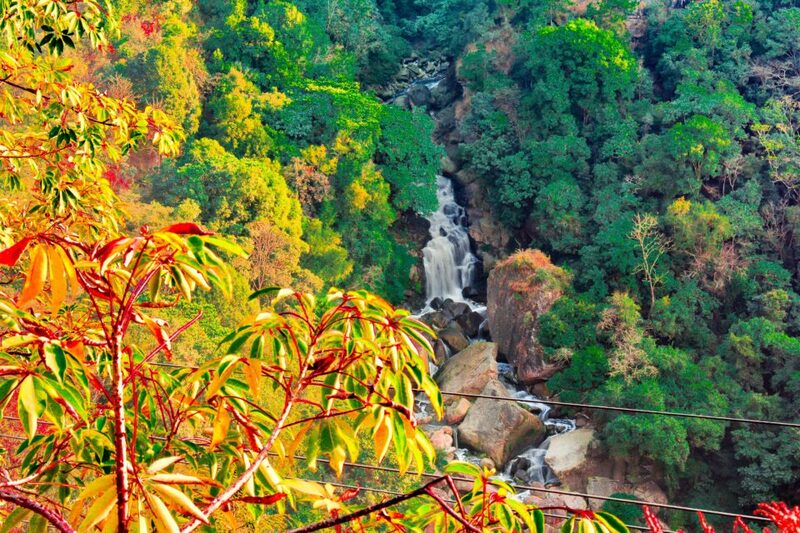 We then drove down to the seven sisters falls or the Nohsngithiang Falls, it is the fourth highest falls in India. 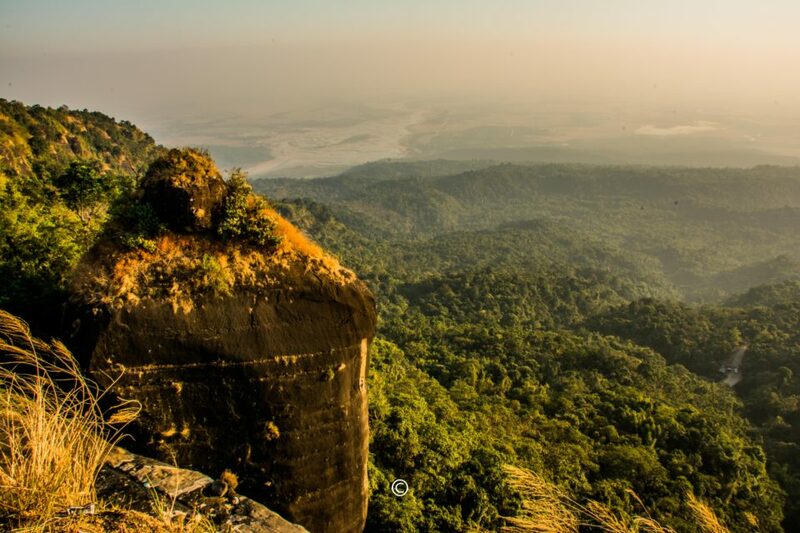 It starts with seven sections on top of the beautiful limestone cliffs and drops into stunning Khasi hills. We were in time to catch the setting sun. This falls is viewable only during the rainy season as this waterfall feeds off of rain waters only. Though I covered Bishop and Beadon falls on a different day, I am adding it to this article for the sake of completion. Bishop and Beadon point is a place from where one can watch the Bishop falls and Beadon falls. The Bishop falls has a sheer drop that is clearly visible from the viewpoint. The Beadon falls is in many step like fashion and one can not view this falls continuously from this viewpoint. 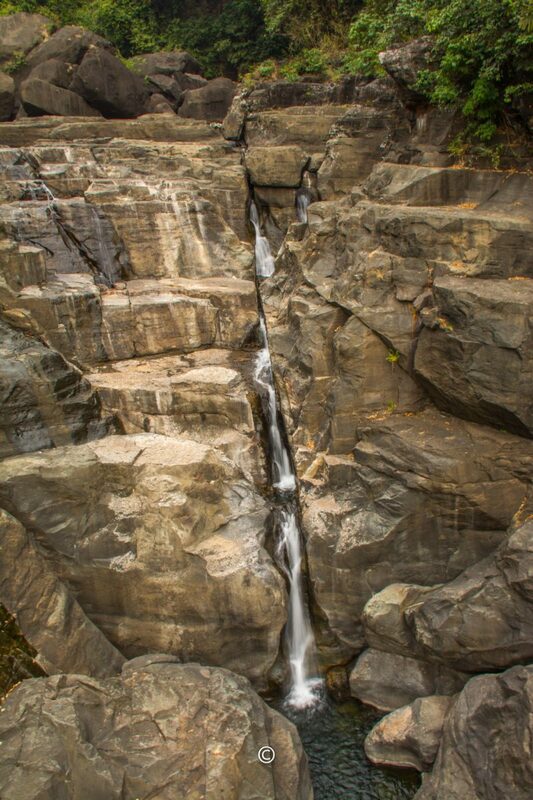 Make sure it is a clear day to go watch these falls as this viewpoint is on the opposite side of the ravine. On a cloudy or misty day one will not be able to view the falls at all.